A member of the mint family, Salvia hispanica is an Aztec super-grain that boasts the highest known whole-food source of dietary fibre. 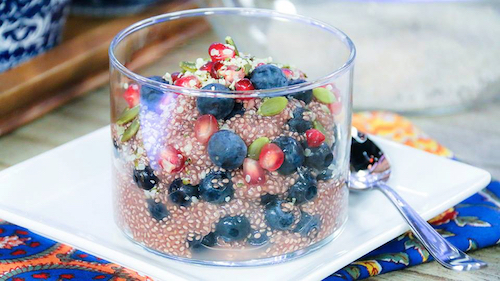 The word "chia" is derived from the Nahuatl word chian, meaning oily – and for good reason. More than half the calories in chia come from anti-inflammatory Omega-3 fat called α-linolenic acid (ALA). 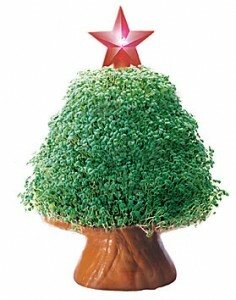 In the United States, the first substantial wave of chia seed sales were tied to "Chia Pets" in the 1980s. About 500,000 Chia Pets are sold every year... if I could just convince everyone to eat the seeds instead of sprouting and LOOKING at them, I could really transform our health! 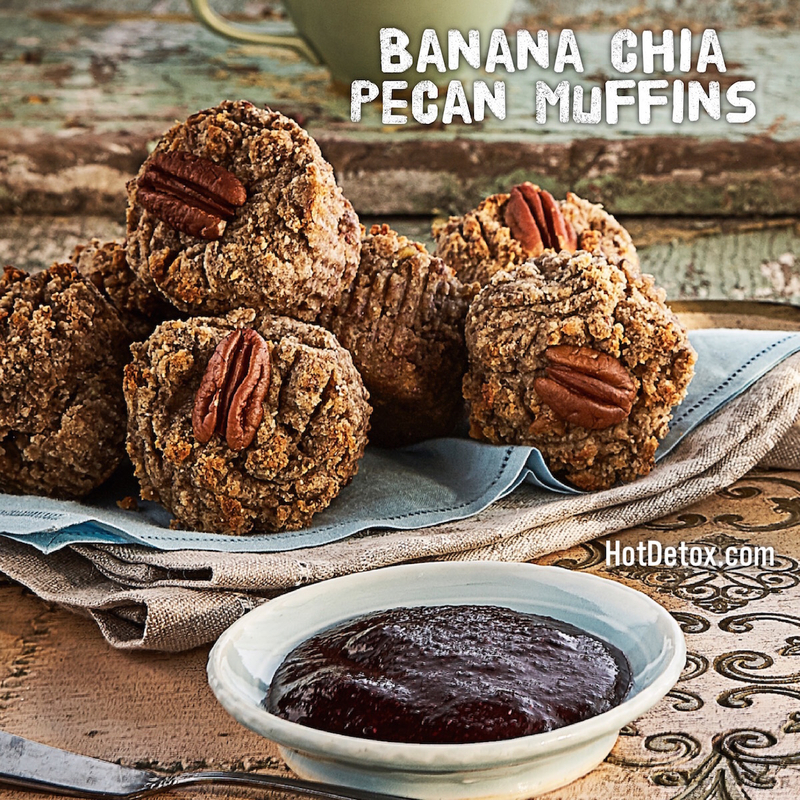 My sister, Lynn devised these tasty Banana Chia Pecan Muffins (from Hot Detox) which use ground chia seed and water, instead of egg. Lynn's allergic to eggs and she follows a paleo diet (which also makes these vegan), and I think you'll agree that her results are very tasty! Pudding for breakfast? Sure! 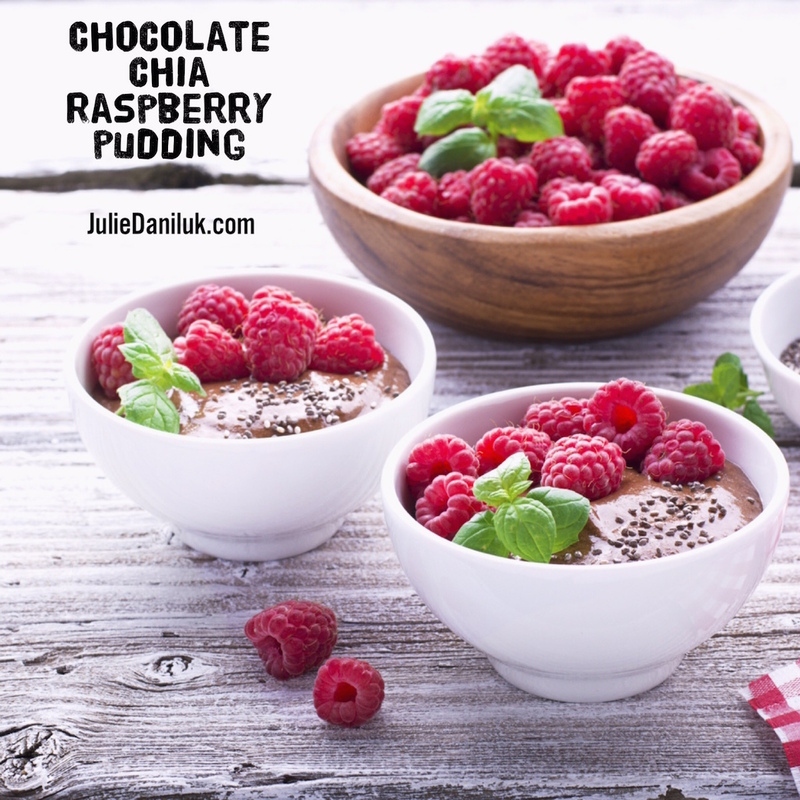 Everything about my dreamy Fan Favourite Chocolate Chia Raspberry Pudding is healthy, nutritious and anti-inflammatory. Whole Chia Seeds absorb moisture, making a milky gel-pudding texture... it's a fun way to start (or end) the day. You'll be so surprised at how many people around your table hoard my Gluten-Free Onion Mushroom Gravy (from Happy Holiday Menu), you too will say, "Gluten-Free OMG"! 1. Can Chia Seed help regulate blood sugar? YES! Chia seed contains healthy fats that, when consumed as a part of a balanced meal, help stabilize blood sugar. The healthy fats in chia seed decreases the overall glycemic index of whatever it is you’re eating alongside them. As I outline in my books, managing your glycemic index to minimize blood sugar rollercoaster rides, helps prevent and control inflammatory conditions. Not only is the fat in chia seed beneficial, the fibre has blood sugar stabilizing properties,2 minimizing blood sugar spikes by slowing down the rate at which food is broken down into sugar. 2. Can Chia Seed help regulate your digestive system? YES! Chia seeds are a rich source of soluble and insoluble fibre, which, along with water, is necessary for moving things out of your body and maintaining a healthy digestive system. 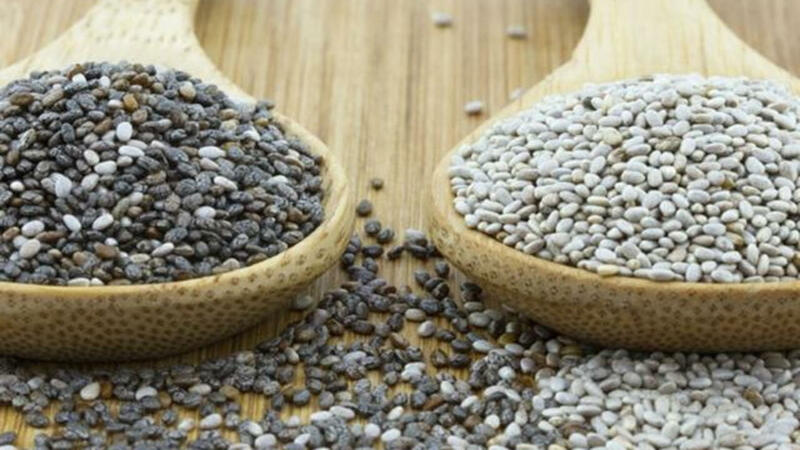 Fibre-rich foods, like chia seed, minimize your risk of developing constipation or a more serious inflammatory bowel condition such as diverticulitis.3 Plus, the mucilaginous gel which coats each seed helps your body sweep out wastes and toxins. 3. Can Chia Seed boost brain function? YES! As mentioned above, chia seed contains healthy fats called essential fatty acids. They also contain an optimal ratio of brain-friendly Omega-3 to Omega-6 fatty acids that support brain structure and brain function from memory to mental health.4 Talk about brain food! 4. Is Chia Seed heart-healthy? YES! 5. Is Chia Seed an excellent source of plant-based protein? YES! United States Department of Agriculture Agricultural Research Service, National Nutrient Database for Standard Reference Release 28: Basic Report: 12101, Nuts, chestnuts, european, boiled and steamed.